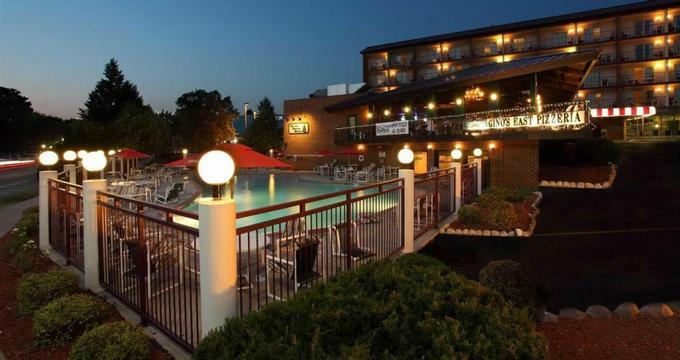 Located in the heart of downtown, Harbor Shores on Lake Geneva is an unpretentious lakefront hotel just steps away from the tranquil waters of Geneva Lake, and it’s many attractions. The five-story hotel features well-appointed guest rooms with private balconies boasting panoramic views of the lake, upscale amenities and facilities, and gracious, welcoming hospitality. Accommodations feature comfortable beds in high-quality linens, en-suite bathrooms with bath and shower combinations, and modern comforts such as flat-screen TVs and DVD players, fireplaces, wet bars with microwaves, fridges and coffee makers, and complimentary wireless Internet. Amenities at the resort include indoor and outdoor swimming pools and a hot tub, a fully equipped fitness center, new event and functions spaces, and a casual restaurant that serves lunch and dinner daily. An array of activities is offered throughout the year from hiking, mountain biking, fishing, and water sports in the summer to skiing, cross-country skiing, snowboarding, and ice-fishing in the winter. Harbor Shores on Lake Geneva is situated a short walk from the Lake Geneva Public Beach and a few miles from Big Foot Beach State Park. Harbor Shores on Lake Geneva features well-appointed guest rooms with private balconies boasting panoramic views of the lake. All guest rooms and suites have one or two king or queen-size pillowtop beds dressed in deluxe linens and soft pillows, and en-suite bathrooms with bath and shower combinations, thick towels and bathrobes, and branded bath products. Modern amenities include flat-screen televisions with cable channels and DVD players, mini-kitchenettes and wet bars with mini-fridges, microwaves, Keurig coffee makers, irons and ironing boards, telephones with free local calls, hairdryers, and complimentary wireless Internet. Unique additions to rooms include dining certificates, couple’s massages, custom-made birthday cakes and ice cream treats for two, plush bathrobes, bottles of wine and Champagne, gift baskets and floral arrangements. A complimentary breakfast is served every morning and includes coffee, tea and hot beverages, fresh fruit and juices, cereals, granolas and yogurts, egg dishes, and freshly baked pastries, and bread. Gino’s East Restaurant and Bar serve lunch and dinner daily, offering menus of locally sourced and freshly prepared cuisine. Amenities and guest services at Harbor Shores on Lake Geneva include the on-site restaurant, Gino’s East Restaurant, and Bar, which is open for lunch and dinner daily, a complimentary breakfast is served every morning, a 24-hour front desk service, and a fully-equipped business center with computers, printing, copying, and faxing services. Facilities include heated indoor and outdoor swimming pools and a whirlpool and sauna, a fully equipped fitness center, a gift shop, meeting and banquet facilities for groups of up to 250 people, and free on-site parking. Harbor Shores on Lake Geneva offers 5,300 square feet of flexible and fully equipped conference capabilities for groups of up to 250 people. Meeting rooms are equipped with state-of-the-art audiovisual and sound systems, as well as individual climate controls and high-speed wireless Internet access and can accommodate both small and large functions and events ranging from weddings and receptions to business meetings and corporate gatherings. The Geneva Lakes area offers a variety of things to see and do, ranging from hiking and walking around the lake, world-class golf, horseback riding and zip line adventures to specialty shopping, award-winning dining, luxury spas, and seasonal festivals. Other attractions and activities include downhill and cross-country skiing, miniature golf, boating and cruises on the lake, guided fishing charters, water sports and water-based activities, snowmobiling, museums, art galleries and antique shopping.